Before you read on, please note children must be 12 years and older. There is no flexibility on this. If children are in your group, please state their ages. This property is built on 3 levels and has a lot of stairs so guests must be able-bodied. You need a car as there is no public transport nearby - or else you can use taxis. We accept up to 2 house-trained dogs which must be kept on leads to safeguard our livestock. We do not accept all breeds. When making an enquiry, please state breed. An immaculate spacious property with 2 bedrooms and one bathroom on a private, secure gated estate situated on a quiet lane. Approx. 950 square feet. Lounge, separate dining room with wood burning stove, modern kitchen, bathroom, all presented to a high standard and furnished with a mixture of modern and antique furniture. Accommodation is set up for 4 guests. However, we can sleep 6 with the use of 2 chair beds and there is an extra charge for guests 5 and 6. This property is part of our home and we will be delighted to assist you during your stay. Town Green Farm is my passion! I have lived here with my husband since 1997. Having retired from my equestrian pursuits, I decided to refurbish the Gatehouse to a high standard and begin self-catering rentals. I call myself the 'estate manager' so I am on hand if you need information, help, or perish the thought, if something stops working (rare). Please read our reviews which will tell you more about me. This quiet, private location is a rarity. You will think you are staying in the country. Yet we are very convenient as a base to explore London or many of the tourist attractions in the south of UK. We are also close to many important sporting events inc. racing at Ascot, Henley, Smiths Lawn Polo, Wentworth and Sunningdale golf. A rural location away from the rat race, yet with easy access to London (Waterloo - 34 mins), and the M25/M3/M4/M40. toilet, combination tub/shower, Round-ended bath with shower above and screen. Family bathroom with round ended bath and shower above, basin, wc. Heated towel rail. Shavers point. Under sink storage for toiletries. Good sized mirror. Guest toiletries and shower cap for ladies. Plenty of off street secure parking. Unlimited hi-speed free wifi connection. Logs, kindling wood, fire-lighters and paper supplied. Comfortable seating for 6. Coffee table, side table, books, board games. TV and DVD player. Wifi access. 2 single chair beds. Cooker, hob, fridge/freezer, washing machine, tumble dryer, microwave, toaster, kettle. Iron and ironing board. Royal Doulton dinner service, pots, pans etc, cutlery, glasses. Large oak dining table seats 6. Large selection of hardback and paperback. Autobiographies, biographies, novels. A multitude of golf courses in the area - including Wentworth if you are looking for somewhere to stay for the PGA. Wentworth is 3.5 miles away. Only outside in smoking area. Notes on accommodation: Dogs are very welcome. Outside: 15 acres of grounds where you may wander. In the summer we have some Sussex cattle grazing. We also keep chickens, bantams and ducks. Ample secure off-street parking. Cleaning / Towels / Linen / Maid service: Bed linen and towels provided. Cleaning services available on request. Other: Study area over the entrance archway. Large walk-in airing cupboard and storage. Everything about our visit was utterly exquisite. From the moment we arrived, to the moment we left, we were treated with warmth, friendliness and a hospitality that would be extremely difficult to surpass. We were welcomed with open arms and throughout our stay, the owners were very attentive to our needs whilst not being at all intrusive. By the end of the holiday, it felt like we'd become part of the family. The layout of the Gatehouse makes it a unique, charismatic and really fun place to stay. The added magic of Christmas made it feel like we were in our very own romcom. The property is decorated beautifully and features all mod cons and is incredibly warm and cosy. We all agreed that we enjoyed some of the best sleep we'd experienced for a long time as the beds were extremely comfortable. Views from the upstairs rooms look straight out onto the fields and woodland. Nearby are many attractions of historic interest and natural beauty which make this property a must for anyone wanting to visit nearby Windsor Castle, Great Park and surrounding area. Thank you so much for making our Christmas amazing and for giving us lifelong memories of a beautiful holiday. We wouldn't hesitate in recommending this property to anyone who is looking for something completely different and out of the ordinary. And how lucky was I to have such friendly, cheerful and appreciative guests staying with us over Christmas. Just perfect! 'Auntie' would be overjoyed to have you all stay again. Lovely, lovely people. Grab them if they want to book. Lovely Gatehouse on an impressive former Farm Estate. Enough privacy in combination with a very welcoming owner. We felt right at home. Lovely area with the Windsor Great Park next door and the beautiful Savill Garden around the corner. Windsor Castle within 10 minutes, Londen City center 35 minutes by car or train. For golfers this is a location made in heaven, with Wentworth, Sunningdale and other magical courses in the neighborhood. Wonderful guests from Holland. They looked after our Gatehouse so well and even stripped the beds on departure. They are friendly and easy going and I would recommend them immediately. We had a great time in the gatehouse and Lesley made us feel very welcome. Our boys spent times with all the animals, a perfect plays to stay when you love the countryside and want to visit London and all the other interesting places. Wonderful, friendly guests, who left our property in an immaculate condition. The boys were delightful and I thoroughly enjoyed introducing them to all our animals. I do hope I will get the opportunity to welcome them again. 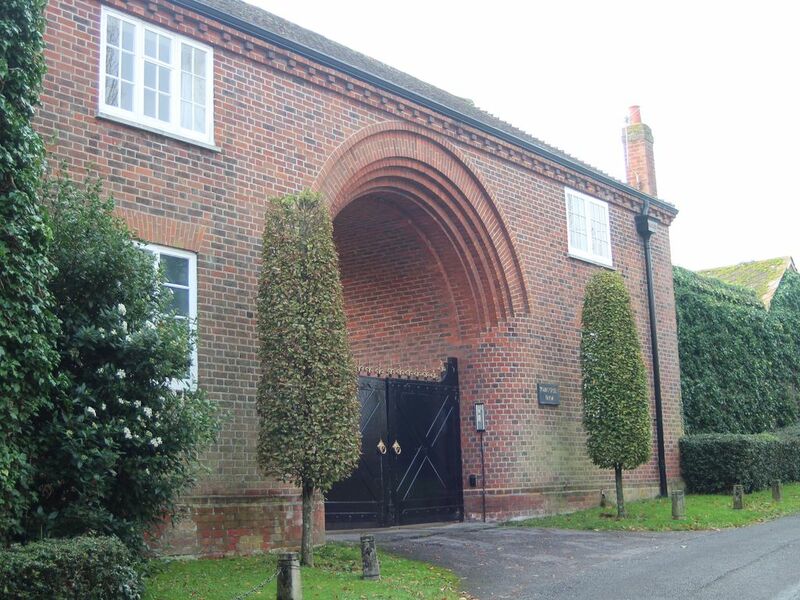 the property was beautiful - private, extremely clean, short of nothing, spacious, lovely furniture, peaceful location, easy to find and in a great location for accessing surrounding areas in Surrey, Windsor, Berkshire and Buckinghamshire. Could not fault it. Lesley the host/owner of the property is on hand if you need her but I doubt you ever would as everything is immaculate and in good order. Lesley is a lovely and welcoming person and we will most definitely return to stay at this property. Lovely couple with a super dog. It transpired we were very much on the same wave length. If they want to book your property, grab them! They are friendly, good fun, and so, so clean and tidy. They looked after The Gatehouse as if it were their own. I sincerely hope they return as they were such fab guests. Excellent - rural and quiet and comfortable. We very much enjoyed our stay. It was for a family event but we were very pleased with being in such a quiet place yet so close to main roads and only a minute or two from Windsor Great Park. Charming guests who were so considerate and helpful. They left our Gatehouse in an immaculate condition - beds stripped, rubbish sorted, used laundry all brought downstairs. It was so clean it looked as if no one had stayed. If these guests come your way, grab them! The very best! The Sun Inn within walking distance and dogs welcome at various pubs in the locality. Windsor Great Park and Savill Gardens are a very short drive. Also The WWII War Memorial and Runnymede (1 mile). Windsor 15 minutes. Plenty of local restaurants and pubs within a short drive. Savill Gardens and Windsor Great Park - 0.5 miles Thorpe Park and Legoland within 7 miles. Ascot 6.5 miles. Easy access to UK motorway network. Changeover Day: Flexible. Check in 4pm. onwards. Check out by 10am. Guests must be able-bodied as there are a fair few stairs in The Gatehouse. Transport recommended. We are not on public transport routes. .